WAKEFIELD — When the Cape Ann League’s swim coaches met to decide All-Stars their was no doubt they needed to include plenty of Warriors once again. 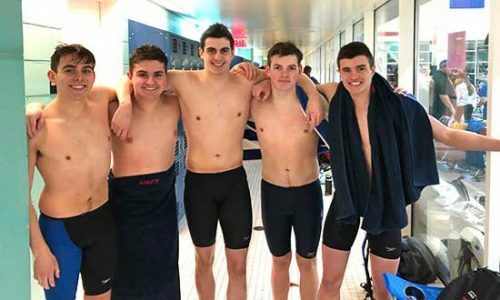 The boys from Wakefield Memorial High School helped the Lynnfield-Wakefield co-op swim team make history as they went undefeated in the CAL, broke seven of 11 team records and had the highest finish as a team in both sectionals and states. The four All-Stars from the team were all from Wakefield: Chris Anastasiades, Antonio Anastasiades, Alex Kent and Johnny Stumpf. It is the second consecutive season that these four have been named All-Stars. All four swam plenty of relays together throughout the season. Together they set new CAL records in the 200 medley and the 200 freestyle relays. A senior captain, Chris Anastasiades was voted Swimmer of the Year in the CAL this year. Antonio Anastasiades was named an All-Scholastic in both the Boston Globe and Boston Herald. The junior won the 100 breaststroke (57.69) at Div. 1 States and the North sectional 200 IM. Antonio holds the school record in the 100 breast, 100 back and 200 IM along with all three relays.